Renowned wine critic Robert Parker may have started his meteoric rise to fame praising (albeit for Bordeaux) the wines of the year 1982 as ‘superb’, but for the residents of Champagne the year had started off with a bleak outlook of frosty weather which, in turn, led in to a cooler than average springtime. Vines awoke in April and flowering began in June in tandem with warmer weather arriving, which crucially stayed throughout the harvest. Summer was ideal with its unbroken run of sunshine and warmth, and the lack of later damp weather in August saw off the threat of yield loss through disease and swelling/dilution. Grapes were ripe by the start of September, at which point a mere sprinkling of rain appeared giving the vines the final irrigation that they needed to be strong and full, and ready for picking from the 17th. The result was that, not only did they produce gloriously ripe fruit of a uniformly high quality, they also provided an abundance of it. In the end, the yield would turn out to be three times the size of the previous years (admittedly small) harvest. The vintage wine was characterised with hints of green to its dark golden appearance, notes of lemon, honey and tart almond to the nose, adding pear, green apple and digestive biscuit to the palate. The wines were described by Moét winemaker Dominique Foulon as being “elegant with a firm finish”. Like the 1980 vintage before it, the blend leant heavier on the Pinot Noir grapes, and was a 60%/40% Pinot/Chardonnay composition, as opposed to the standard 50%/50% mix. The 1982 vintage Rosé was evocative of wild strawberries and ripe fruit with light spices, quickly developing into mocha and nutmeg. The finish provided gamey notes much reminiscent of a red wine, and highlighted the well ripened Pinot Noir content. It too was described as elegant on the palate, and the vintage wine was released in early 1988, with the Rosé following in 1991. Moving on to the year of 1983, this also began with poor weather which Moét would later admit made them initially think that the year would be a write-off. Harsh weather in the winter had not improved by the time spring arrived and conditions remained cold and damp, which once again pushed back on the onset of flowering. In a positive twist of fate conditions quickly picked up and suddenly became as good as they had previously been bad, with flowering finally beginning in late June. Both July and August were warm, giving just enough rain to keep the vines watered and healthy, and once again the Champenois were blessed with a bumper vintage. This one, however, was one step further than the previous years large vintage, and the Champenois were greeted with the largest yield ever recorded (at that time). Cooler weather at the start of September and some last minute heavy rain had slightly delayed harvest, which commenced later than usual on the 26th of September. Due to the overall size of the crop, picking carried on well in to October. The resulting wines were golden in colour, with traces of green. The nose evoked toasty and nutty flavours along with some vanilla, which then gave way to the characteristic traits of brioche and honey. The wine, nicely plump on the palate with good acidity driving through it in to a long fresh finish, was characterised by dried fruit. The vintage was released at the beginning of 1990 and, as if to usher in the new decade, the release of the 1983 saw several packaging amendments. For the first time, the outer box made reference to the specific vintage contained within on both the lid and the ends of the package. There were also changes inside the box, with the neck brace that supported the bottle removed, and the generic insert books evolving in to full year-specific tasting guides. Although still written in French, you were now able to read about the weather conditions of the year, hear Moét’s thoughts about the harvest, and glean information as to what the wine should taste like. The vintage 1983 book made mention of the wine being comprised of 58% Chardonnay and 42% Pinot Noir, and that you can clearly discern what each variety brings to the palate. It also suggests drinking the wine as an aperitif, being that it will harmonise well with delicate foods and lunches! Finally, there was one tiny change to the bottle packaging itself, although it was such a small amendment it would easily have gone unnoticed. The capsule (the metallic cap placed on top of the cork) edging was updated to include the words ‘Muselet EPARNIX’, and a copyright symbol, simply indicating that this part of the packaging (the Muselet is the wire cage that surrounds the cork and capsule) also formed part of the trademarked brand property. Two variations, (N° 181 and N° 182, as seen in the below picture), were issued. No Vintage Rosé for 1983 was declared. 1984 also began with terrible weather conditions, but on this occasion things didn’t improve. Flowering was delayed by a cool and damp spring and, although July saw warmth from the emerging sun, stormy weather arrived in August and remained throughout September. Thus the grapes did not develop fully and retained high acidity. Happily though, another classic vintage was just around the corner. The 1979 vintage hadn’t been declared by Moét, the wines deemed as not having the necessary structure to age like a classic Dom Pérignon should. It’s perhaps surprising then that the very next vintage they did declare suffered exactly that fate. Skipping forward a year, the 1981 harvest had only realised a small crop yield and, whilst the not-perfect 1980 sat in the cellars at the start of its maturation period, the prospect of a muted 1981 release may have forced them in to a tough decision. Well aware that they hadn’t declared the 1979, if Moét then skipped straight ahead to the 1982, a large gap would be left in their market presence, not to mention their profits. Certainly, the last time that they had gone with a gap of 3 clear years between vintages had been as far back as the late 1950’s. The 1980 harvest was smaller than usual due to the climatic conditions which saw cold and humid weather as late as June and July, and resulted in late and uneven flowering. The weather heated up and sunshine in September allowed the grape clusters to swell, but everything was on the back-foot and the harvest began much later than usual, on the 9th of October, in cold and wet conditions. The net result of this was that the wines tended to lack the full body of well ripened grapes, and the uneven higher acids came through on the palate. Dom Pérignon vintage wines tend, in the main, to be a 50/50 mix of Chardonnay and Pinot Noir grapes. In a move tailoring towards the unkind weather conditions, the vintage blend here was adjusted to be 60% Pinot Noir and 40% Chardonnay, the idea being that more fruit, structure and backbone would come from the red grape variety. The tweak only seems to have been partly successful. The final wine was described as being the colour of golden straw, with a nose of toasted brioche, clear preserved citrus, and slight menthol and autumnal fruit. The palate was described as both clean and pure, with a floral, fleshy fullness, a lovely persistence and citrus freshness. Despite what sounds quite a promising blend, respected Champagne expert Tom Stevenson noted it as “too simple and ordinary to warrant a Dom Pérignon vintage”. A Rosé was also produced, being a deep pink in colour, with touches of blueberries to the nose and floral characters to the palate. The 1980 vintage was released in 1987 with the Rosé following in 1988, and now included within the presentation box was a brief leaflet proudly informing you (see picture below) that the sealed cabinet it comes in is the guarantee of the protection and the quality of Dom Pérignon, and that you should insist on it! Also included were some words on Hautvilliers, Moét and the monk Dom Pérignon, but these leaflets (note they are not vintage dated) were exclusively produced in French, which made it difficult to read for anyone not fluent in the language. At the time it may actually have been perceived as foreign and unknown, making the purchase that much more interesting and alluring? Aside of waiting for the small crop of 1981 to be harvested, Moét were kept busy with the issue of a back vintage. This was the first time that the company had released a library wine, but the event for which it was being prepared was historic enough to warrant it – A Royal wedding! In the UK alone over 70 producers created something like 150 different commemorative beverages to celebrate the marriage of Prince Charles to Lady Diana Spencer, but it is doubtful that the Royal couple ever tried any of these brews. The shipment of the extremely small and limited 1961 harvest, selected as it was the birth year of Diana, would not only top the list of commemorative bottles, but was also served to the couple themselves. Just 12 magnums of the 1961 were produced, six of which went to the Royal household for their personal consumption. The other six were distributed amongst UK drinks trade charities, including the Society of Licensed Victuallers, which looked after retired landlords. These magnums came with a specially commissioned label commemorating the Royal event (see image lower down). A further 99 bottles were provided to be served at the wedding reception, which took place on Monday 27th July, ahead of the ceremony on Wednesday the 29th. There has been some confusion as to when the couple were served the Dom 1961, with many assuming it was the wine that they celebrated with on their big day. The drinks ceremony at Buckingham Palace that followed the marriage ceremony at St Pauls Cathedral on the 29th was known as the Wedding Breakfast (a nod to it being the first meal of a married couple’s life). 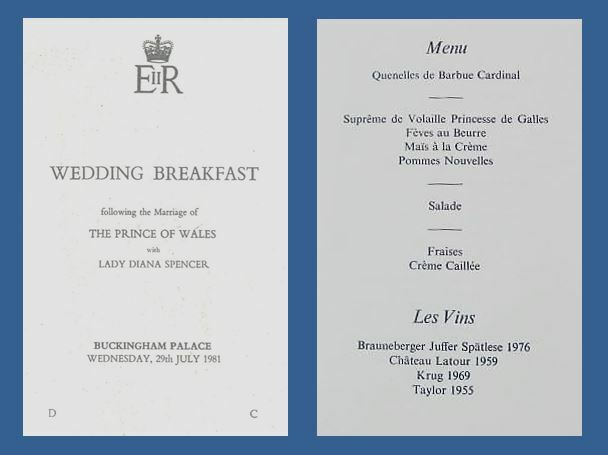 As can be seen from the below image of the order of service for the Breakfast, the Royal couple actually drank Krug 1969 as their Champagne refreshment on the day. It might be assumed that, with so little bottles available in the first place, that every last one would have been consumed throughout the event, however, some did make it through to resurface on the secondary market to collectors. Notable bottles that have hit the auction circuit include one from Roy Mayes, the retired chairman of the Luton branch of the Society of Licensed Victuallers, who sold his bottle to his successor Brian Minnighan. Another bottle which later surfaced came from Princess Diana herself, who gifted one in 1988 to the Director of Harrods, Brian Ames, on his 50th Birthday. As has been alluded to, 1981 produced what would have been the smallest post-war yield, if it hadn’t been for the tiny 1978 harvest. A mild winter and summer had promoted premature growth, but this was then mostly blighted by heavy frosts in late April and hail in May. Cool weather in July was followed by a warmer August and September, and most grapes were picked before the rains fell again at the end of the month. What vines had survived the rollercoaster conditions produced fruit that had seen a long season of growth with sunny weather when it mattered to finish off the ripening. Sadly this quality was blighted by the small quantity and most houses didn’t declare a vintage. As it transpired, producers wouldn’t be worried about it for too long. The 1981’s hadn’t been in the cellars for a year when it became clear just how good the wines of 1982 would be. 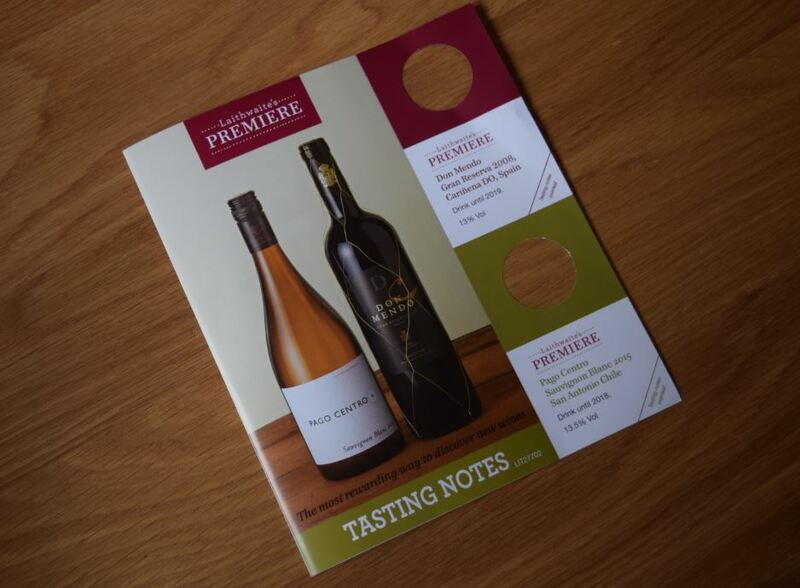 I wrote back in July about the Premiere selections from leading online wine merchant Laithwaites where, for a one-off yearly charge, they send you 2 additional bottles to try every time you purchase a case of wine. These additions are specially picked wines by the Laithwaites team, the idea being that, because you haven’t ordered them, you probably won’t have tried them, and this promotes a good way to expanding your wine horizons. In my first 3 months as a member I noted that the selections provided seemed firmly rooted at the £8.99 price-point, so I was pleased and interested when this months’ selections turned up with recommended retail prices set at £9.49 and £9.99. Time to see if the extra pennies would add much in terms of the quality of these new discoveries. A pleasing pale straw colour, with visible tears in the glass hinting at the high alcohol level from the well ripened grapes. The San Antonio valley is coastal and so the natural heat of the climate is moderated with the cool sea air, giving a long balanced growing season. The nose is extremely full with a myriad of fruits and fragrances vying for attention. Alongside the grassiness that you would expect from Sauvignon Blanc is a touch of dried tropical fruit alongside apples and pears, citrus, kiwi and asparagus. This medium bodied wine is packed with a mouth-watering acidity. The key notes are fleshy green apple, intense lime, cream, and just a touch of oil. The interesting thing about this wine is the way that the layers approach you – one minute you are experiencing the fresh citrus, the next is a fruit medley, and then it is back to the citrus. This carries on throughout the finish, which is extremely long and enjoyable. After I raved about the Tesco Finest Sancerre last month, I am now completely converted to Sauvignon Blanc around the £10-£12 price-point. Being primarily a red wine drinker, and well aware of the fashion for Sauvignon Blanc and the (too) abundant choice in the entry level arena, it has not been something that I have gravitated towards. The producer here is top Chilean estate Luis Felipe Edwards, who have teamed up with award winning New Zealand winemaker Matt Thomson. Clearly winemakers from New Zealand know a thing or two about producing Sauvignon Blanc, and the team effort here and the strict selection of grapes has produced a beautiful wine. I’m definitely going to pick up more of this. From the north-eastern Spanish region of Carinena, this wine is a blend of Tempranillo (60%), Grenache (30%) and Carinena (10%). 6 years maturing in both barrel and bottle have helped to give this wine an opaque dark appearance. The nose is an austere, dark, stewed and confected mixture, with hints of red cherry sweetness and notable liquorice, and was actually incredibly similar to the nose of a Port. The palate is smooth like velvet, but in contrast to the heaviness of the nose, the body comes though as medium and not over-bearing at all. Dark cherry hits you straight away, and this gives way to a slightly distracting acidity which floods the mid-palate somewhat. The finish is of a decent length and does retrieve some of the fully ripe fruits, but I detected a slight alcohol burn (which is odd as this isn’t that high alcohol). After the first glass I left the wine to air for an hour and came back to it. In fairness, the acidity had dropped away, the weight had rounded out and newer flavours of dark chocolate appeared to give the wine the body it needed. This is a wine that I would recommend to decant first, and I don’t think I saw it at its best. In summary, I think I need to try a further bottle to fully evaluate it. It didn’t grab me straight away, which a good wine should be able to do, but there is clear evidence of good wine-making technique. Even allowing for the need to re-try the Don Mendo, I adore the Pago Centro, which gives the ‘try a new wine’ experience a 50% success rate, and keeps me an advocate of the Premiere scheme. I’m already looking forward to next month.